Johnny took a single Move action and advanced 7". He and Durham were the fastest two characters on the board. The wrecked car provided him with heavy cover from the Stix Brothers. For his second action, he fired his Webley Custom Hand Blaster at Stix #3, who was only 7" away from him. This put him at close range, so Johnny got a +1 bonus to his Shoot stat of 4. Rolling 5 combat dice he scored 4 Hits. Stix #3 now had a Cool stat of 2, so normally this would give him a Pinned token but he was already Pinned and a model can only be Pinned once. Pinned tokens do not stack, unlike Injury or Stunned tokens. Furthermore, Stix #3 could not dodge the attack because his Evade stat was now at -1. Johnny rolled 4 combat dice for the Power of his pistol, looking for Hits. He got 2. Stix #3 could reduce these if he rolled Armour results against his reduced Resist stat of 2. Sadly, he failed to get any and so once again, he was seriously injured and he took two more Injury tokens, which reduced his stats by a further 2. When a model is reduced to a Cool of 0 or less, he or she counts as being Incapacitated and is out of the game, either dead or unconscious. First blood to Team Alpha. Johnny attempted to return his Star chip to the bag by rolling 5 combat dice against his Cool of 5, hoping to score at least 1 Special result. He succeeded and the Star chip went back into the bag, giving him the opportunity to activate later in the game. Before drawing the next Star chip, Johnny played his Wrong-Footed Chicanery card. This meant I drew three Action chips and returned any friendly chips back in the bag, but any enemy Action chips were placed to one side and could not be used until the next turn. I drew 2 black Star chips and 1 red Star chip, so the Stix Brothers lost two Star chips. Very sneaky play but a great tactic seeing as Team Alpha were outnumbered. Wulf decided to make a Sprint double action, which allowed him to move twice plus an extra 1d6". He has a Move of 6" and I rolled a 4 for his extra distance, so he ran 16" in total. 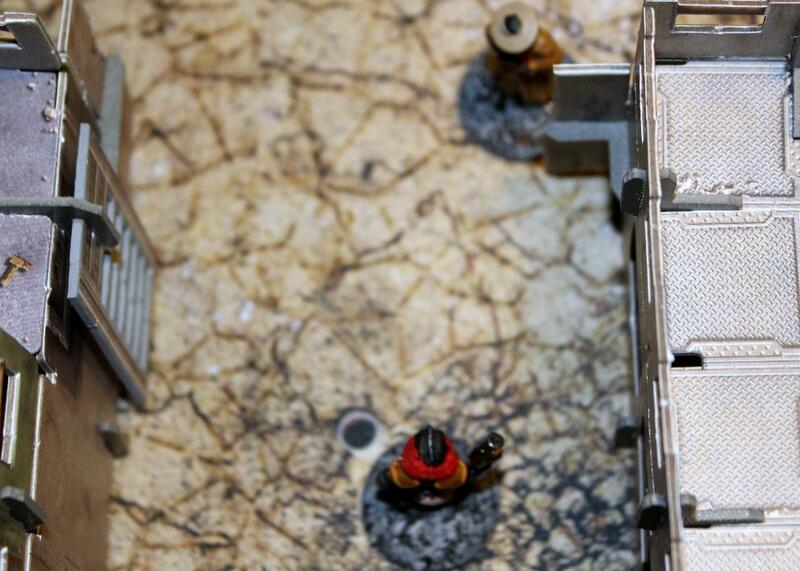 This placed the Viking warrior by the ladders of the biggest building on the tabletop. He has a Cool of 4, so I rolled 4 combat dice to see if he could return his Star chip back in the bag, but his luck was out and I failed to get any Special results. 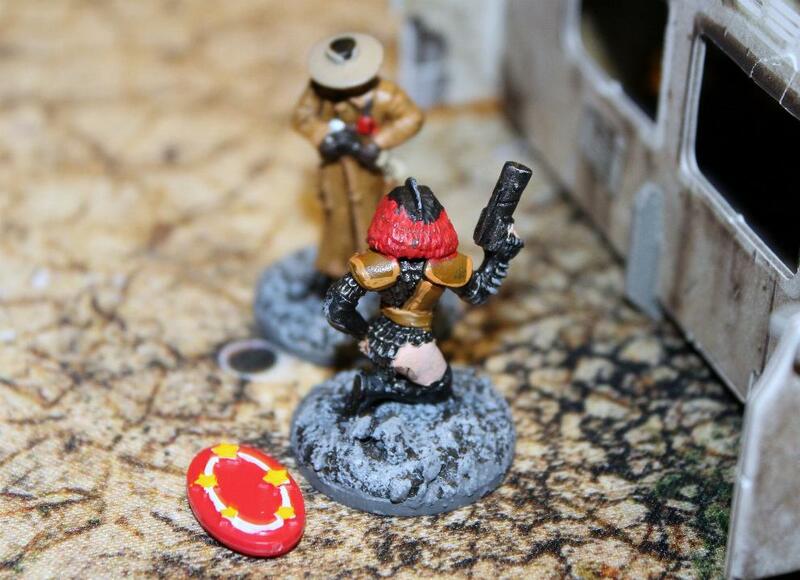 As a consequence, his turn was over and he received a Pinned token. 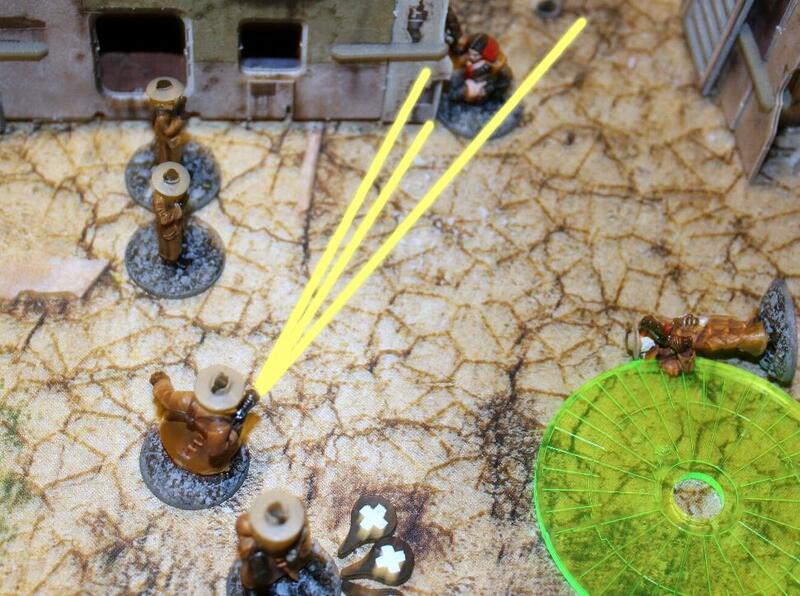 Stix #1 threw a Beam Polarizer Bomb from his Armoury cards 3" in front of him close to the fallen Stix #3. A Beam Polarizer blocks firing across a 3" diameter circle but only affects Blaster type weapons. He placed it there to prevent Johnny from firing at him and Stix #2. For his second action he turned to face Wulf and Snap Fired his Custom Hand Blaster at him. The range was only 7", which was close range and gave Stix #1 a +1 bonus to his Shoot stat of 3. Rolling 4 combat dice he scored 2 Hits. Wulf had an Evade stat of 2 but he failed to get any Special results on the combat dice so his dodge attempt failed. Rolling 4 combat dice for his Blaster's Power of 4, Stix #1 only scored 2 Hits. Wulf was behind heavy cover, so he added +2 to his Resist stat of 4 to reduce the damage. Rolling 6 combat dice, he scored 2 Armour results, which reduced the power of the attack to 0. However, a score of 0 on the Injury chart gave a Stunned result. Wulf took one Stunned token, which reduced all of his stats by 1. Stunned tokens are a lot easier to remove than Injury tokens but their effect is the same. Finally, Stix #1 attempted to return his Star chip to the bag but he failed to roll any Special results so he became Pinned and his activation for this turn ended. With a Move stat of 7", Durham is very fast. She took a Sprint double action, and added 1d6" to her Move total. I rolled a 3, so she ran 17" to end up in between two buildings close to Stix #4 and Stix #5. She rolled 4 combat dice to try and return her Star chip to the bag and she succeeded by scoring 1 Special result. I decide to activate Durham again as she had a cunning plan. She played her Chicanery card - Red Sneak Attack. Note that this Chicanery card is only available with the Build a Mutie boxed set and although it is actually called Sneak Attack, there is a different Sneak Attack Chicanery card in The Good, The Bad and The Mutie starter boxed set. So to differentiate the two I'll call the new one Red Sneak Attack because it includes a picture of Durham Red on the card. 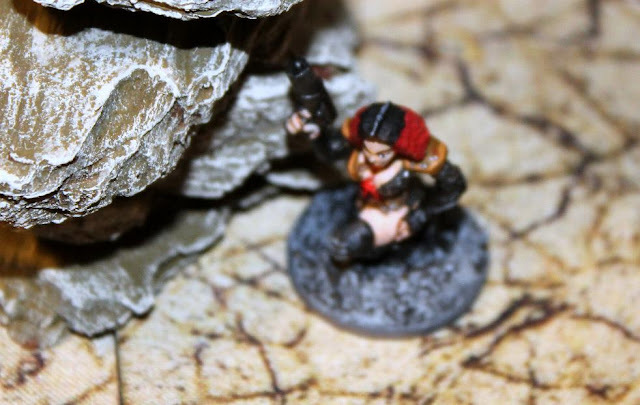 What it does is to allow a model who is out of Line of Sight of an enemy to make a normal Move action and then take an Aimed Shot, effectively giving her three actions for the price of two. Durham was out of sight of all of the Stix Brothers. She moved 2" to the corner of the building. When moving, a model does not have to move their full allowance - they can move less if they want to. Because Stix #1 had his back to her, she targeted him. It was short range and she only fired one of her two Custom Hand Blasters at him. With an Aimed Shot, the firer may either add +2 to its Shoot stat to represent more careful aiming or add +2 to the weapon's Power representing aiming for a vulnerable spot. Durham opted for the +2 to the Power. Adding +1 to her Shoot stat of 3 because of the short range modifier, she rolled 4 combat dice and scored 3 Hits. As has been mentioned before, the Stix Brothers are not good at dodging with a pitiful Evade stat of 1. Not surprisingly, he failed to dodge the attack. Durham rolled 6 combat dice for the Power of her Blaster and scored 4 Hits. Stix #1 had a resist stat of 4 but this was reduced to 3 because he was being attacked in his Back Fire arc. He rolled 3 combat dice, looking for Armour results and scored 1. Durham's attack Power of 4 was reduced to 3, which still resulted in Stix #1 being grievously Injured. He took 3 Injury tokens. Ouch! Once again Durham succeeded in returning her Star chip to the bag. Annoyed at Durham Red for shooting his brother in the back, Stix #2 played his Stone Cold Chicanery card, which allowed him to take three Snap Shot actions instead of two. He used them all against Durham. She was 5" away from him but in heavy cover from where he stood. For his first shot he rolled 4 combat dice (Shoot stat of 3 +1 for the short range modifier), looking for Hits. He got 2. Durham rolled 3 combat dice for her Evade stat of 3 and scored 1 Special result. She dodged but did not move 3" away. For his second shot, Stix #2 scored 3 Hits and this time Durham failed to dodge the attack. The Stix Brother scored 1 Hit result for the Power of his attack. Durham rolled 5 combat dice for her Resist stat of 3 plus 2 for being in heavy cover. She rolled 2 Armour results which reduced the Power of the attack to -1, which was no effect on the Injury chart. Surely it'll be third time lucky, thought Stix #2. His third shot scored 2 Hits, but Lady Luck was shining on the mutant vampire and she easily dodged the attack by rolling 2 Special results. Again, she stayed put. Stix #2 was furious and the two combatants swapped insults. He did succeed in returning his Star chip to the bag. Just to recap, there were now two black Star chips and two red Star chips left in the bag. They play their Firing Line Chicanery card, which allowed their leader and friendly models within 6" of him to each make an immediate Snap Shot action. All shots must target one nominated model within Line of Sight of the leader, which in this case, meant Wulf Sternhammer. The leader, Stix #1 was grievously wounded so couldn't shoot because his Shoot stat was reduced to 0, but Stix #2, #4 and #5 could all act. Wulf was going down! Stix #2 shot first and because Wulf was only 7" away, that put him in close range, so the Stix Brother added +1 to his Shoot stat of 3. Rolling 4 combat dice, he scored 2 Hits. Wulf had been Stunned earlier, so all his stats were reduced by 1. This now gave him an Evade stat of 1 and not surprisingly, he failed to dodge the attack. 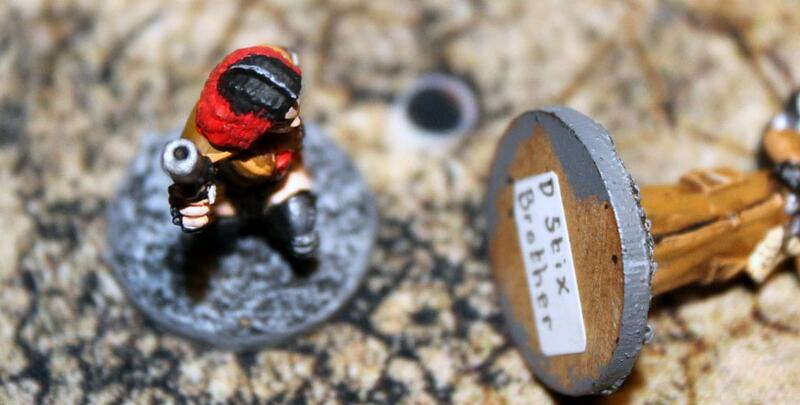 Rolling 4 combat dice for his pistol's Power of 4, Stix #2 scored 3 Hits. Wulf's Resist stat of 4 was now reduced to 3. Looking for Armour results on 3 combat dice he managed to get 2, which reduced the damage of the attack from 3 to 1. Even so, this meant an Injured result on the Injury chart so he took an Injury token. This reduced his stats by 1 and stacked with his previous Stunned result. Styx #4 shot next but this time Wulf was at long range so he only rolled 3 combat dice for his Shoot stat. He scored 2 Hits, which Wulf could not dodge because his Evade stat was now at 0. Stix #4 only scored Hit 1 for the Power of his attack. Wulf rolled 2 combat dice for his reduced Resist stat of 2 and scored 1 Armour result, reducing the damage of the attack to 0. But, as we've seen before, this counted as a Stunned result on the Injury chart, so poor Wulf took a second Stunned token and now all of his stats were reduced by 3. Things were not looking good for the big Viking warrior. The end came quickly when Stix #5 fired. He scored 2 Hits which Wulf could not dodge. This was followed by 2 more Hits for the Power of his Custom Hand Blaster. With a Resist stat of only 1 Wulf failed to get any Armour results so he was seriously injured and he took two Injury tokens, which Incapacitated him and put him out of the fight. That was a good use of a Chicanery card for the Stix Brothers. The Stix Brothers are actually better at fighting than shooting, so Stix #4 decided to take a single Fight action against Durham Red. This allowed him to move 3" towards his target and then engage in close combat. 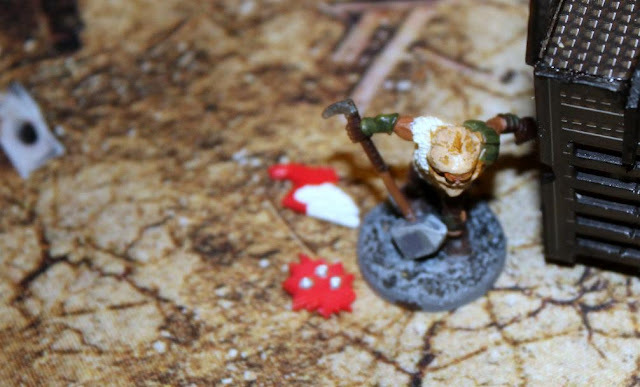 His Fight stat was 4 and there were no modifiers applicable so I rolled 4 combat dice for him, looking for Hits. He scored 3. However, as with shooting, the defender gets to dodge the attack if they can roll at least 1 Special result against their Evade stat. Sure enough, Durham did and she moved 3" back, out of the fight. Not to be deterred, Stix #4 made a second Fight action and closed in 3" hoping for a better result this time. He scored 2 Hits and this time Durham failed to dodge the attack. Because he was not armed with a close combat weapon, the Power of his attacks equalled his Fight stat of 4. He only rolled 1 Hit on 4 combat dice. Durham rolled 3 combat dice for her Resist stat of 3, looking for Armour results and she got 1, which reduced the damage of the attack from 1 to 0. This gave her a Stunned result on the Injury chart and all of her stats were reduced by 1. Stix #4 failed to return his Star chip to the bag, so he took a Pinned token and his activations were over for this turn. Johnny took an Aimed Shot double action, targetting Stix #2 with his Westinghouse Variable Cartridge Blaster and he played the No. 4 Cartridge from his Armoury cards, which added +1 to the Power of the attack and had a 3" Blast radius. This meant that both Stix #1 and Stix #5 would be caught in the blast if his shot was accurate. Despite shooting through the Beam Polarizer's area of effect, it did not effect Cartridge weapons. Oops, a bit of an oversight for the Stix Brothers! Johnny decided to add the +2 bonus of his Aimed Shot to the pistol's Power. It was a long range shot at 12" so Johnny suffered a -1 penalty modifier to his Shoot stat of 4. He rolled 1 Hit but Stix #2 failed to dodge it. 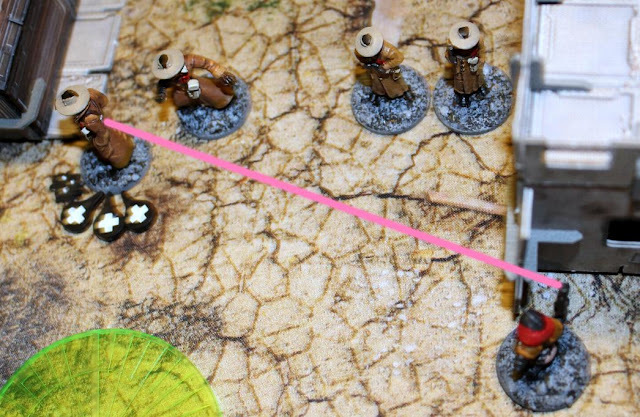 At this point, Stix #2 could have used his Gunfighter skill to return fire on Johnny, just as Durham Red had done against Stix #3 in the Deployment Phase of the game, but the Beam Polarizer prevented him from hitting Johnny. How ironic! Johnny rolled 7 combat dice (4 for the Power of the pistol, +1 for a No.4 Cartridge and +2 for an Aimed Shot), looking for Hits. He rolled an incredible 6 Hits. Come what may, this was going to hurt Stix #2! Rolling 4 combat dice for his Resist stat of 4 the long-coated Strontium Dog rolled 2 Armour results and reduced the power of the attack down to 4. However, any result of 3+ on the Injury chart was classed as grievously injured and Stix #2 took 3 Injury tokens. 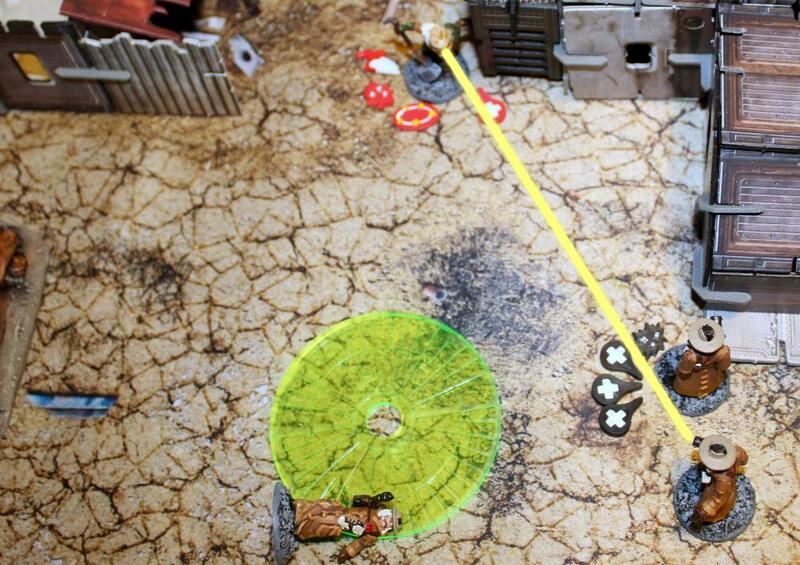 Stix #1 was only 1" away from Stix #2, well within the Blast radius and he automatically took a Power 4 hit. The Power was reduced by 1 for each inch away from the centre of the Blast the target was. The Aimed Shot bonus did not apply, but the No. 4 Cartridge modifier did. 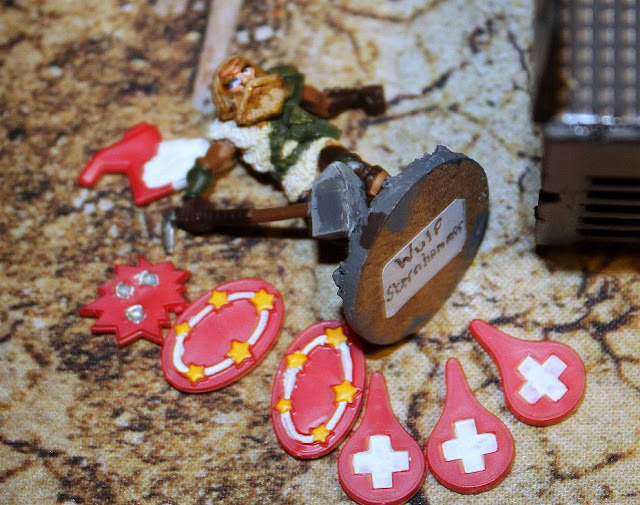 Stix #1 failed to Resist the attack and so was grievously injured again, taking a further 3 Injury tokens, which Incapacitated him putting him well and truly out of the game. Stix #5 was 3" away from the centre of the blast so took a Power 2 hit. He managed to roll 1 Armour result and reduced it to damage 1. He was Injured and he took one Injury token. Despite having a Cool stat of 5, Johnny failed to score any Special results in his attempt to return his Star chip to the bag and so his activation ended and he took a Pinned token. Now there were only two Star chips left in the bag, one of each colour. Durham took a chance on going up against Stix #4 in close combat, despite being Stunned and having a lower Fight stat. Madness, you say? No, because she used the Electronux from her Armoury cards to gain a +3 bonus to her Fight stat for one close combat attack. In addition, she gained a further +1 bonus for Stix #4 being Pinned. Now the odds were very much in her favour. Rolling 6 combat dice, she scored 4 Hits and the Stix Brother failed to dodge them. With a Power of 6 she scored 4 more Hits for the damage of her strike. Stix #4 managed to get 2 Armour results for his Resist stat rolls and reduced the damage down to 2. This was classed as a serious injury result and he took two Injury tokens. Durham pressed on with a second Fight action, but this time without the Electronux. Her Fight stat was down to 2 for being Stunned but Stix #4 was still Pinned so she gained a +1 bonus, bringing her back up to a Fight of 3. She scored 1 Hit, which Stix #4 could not dodge. With a Power of 3, she scored 2 Hits for her damage and her opponent failed to Resist them. A second seriously injured result incapacitated him and thus won Team Alpha the game. Durham used her Bloodsucker skill, which she can use if she takes an opponent down with a close combat attack. She must take a Cool test. She failed to get any Special results and so was Pinned but she gained a +1 bonus to her Cool stat for the rest of the game. Note this bonus is not cumulative. She did succeed to return her Star chip to the bag. With two Star chips still left in the bag I had to play on, even though Team Alpha had won. I used a Hunker Down double action on Stix #2. His Move stat was now down to 2". 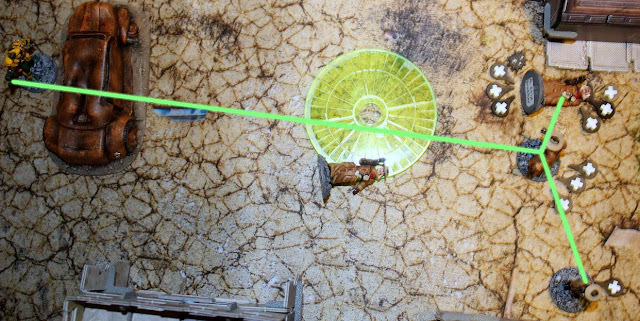 He could move this far plus the result of a roll on 1d6 to find cover and reduce the extent of his damage. I rolled a 3 for him and so he moved back 5" to the far corner of the large building. He then rolled a number of combat dice equal to his unmodified Resist stat of 4, looking for Armour results. For each Armour result rolled, he removed one Injury token down to a minimum of one, i.e. 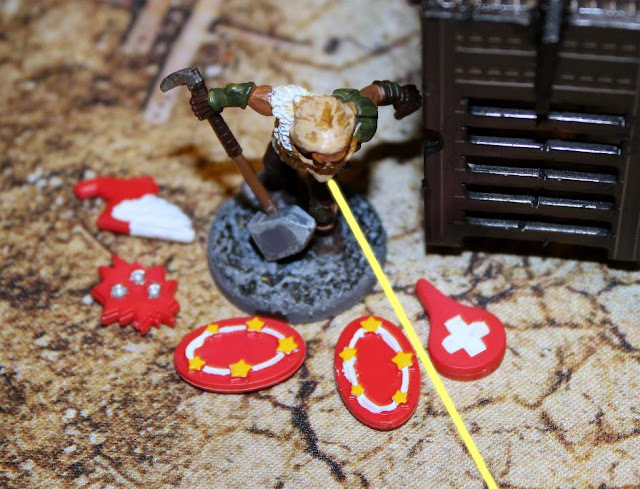 an injured model can't remove the last injury token from itself by using Hunker Down. He rolled two Armour results and so removed two of his three injury tokens. He failed to return his Star chip to the bag, which I was glad of! 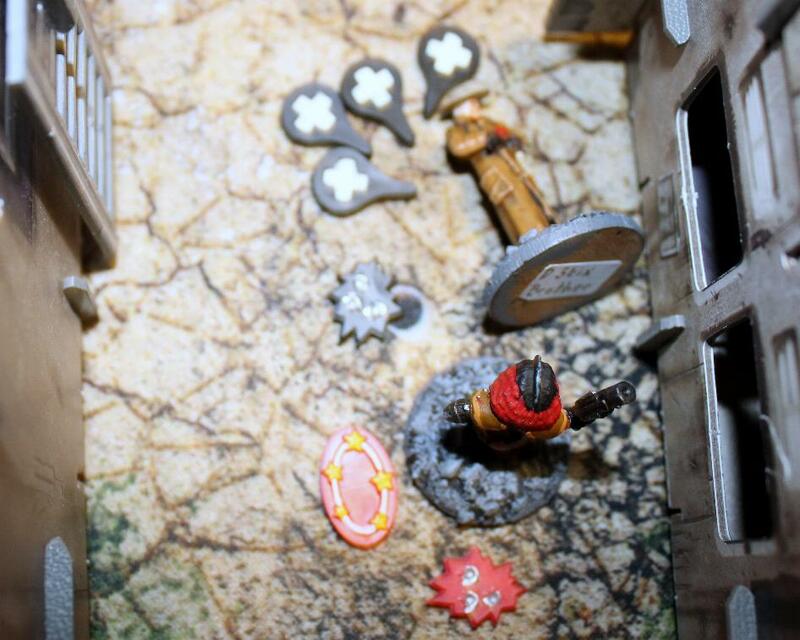 He gained a Pinned token, not shown in the photo above. A model who is Pinned at the start of their activation may attempt to remove it by scoring at least one Special result on a Cool test. Durham tried but failed. 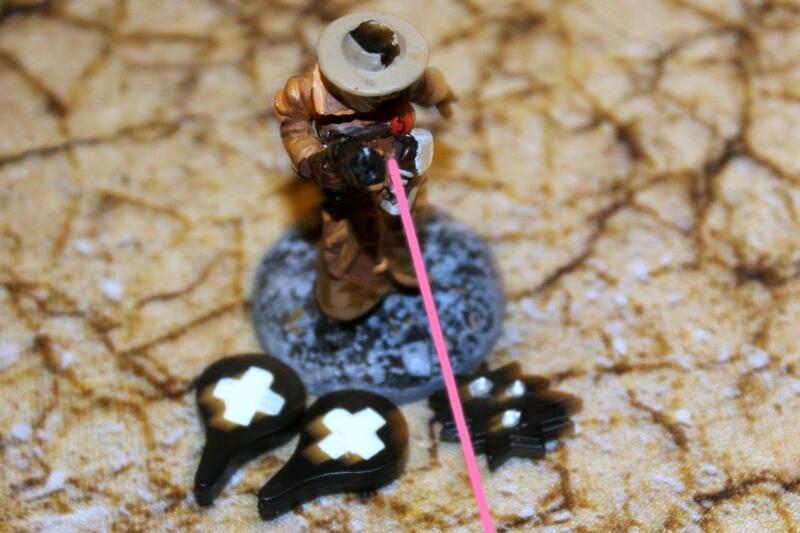 So, she had to take the Shake It Off single action to automatically remove the Pinned token. For her second action, she made another Shake It Off action and automatically removed her Stunned token, bringing her back up to full stats. There was no point in trying to return her Star chip to the bag. 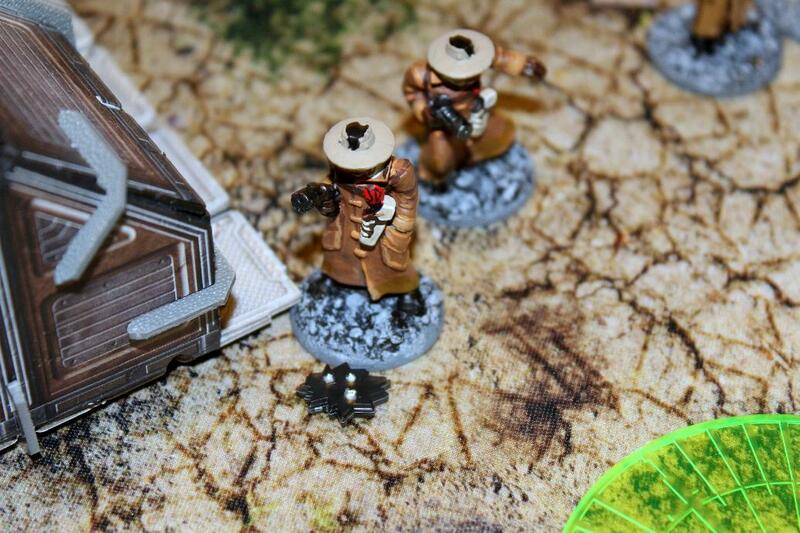 They'd all been drawn and the game was won with three out five of the Stix Brothers down and out and only one of Team Alpha being Incapacitated. I won't lie, that took a hell of a lot longer to play than I was anticipating. 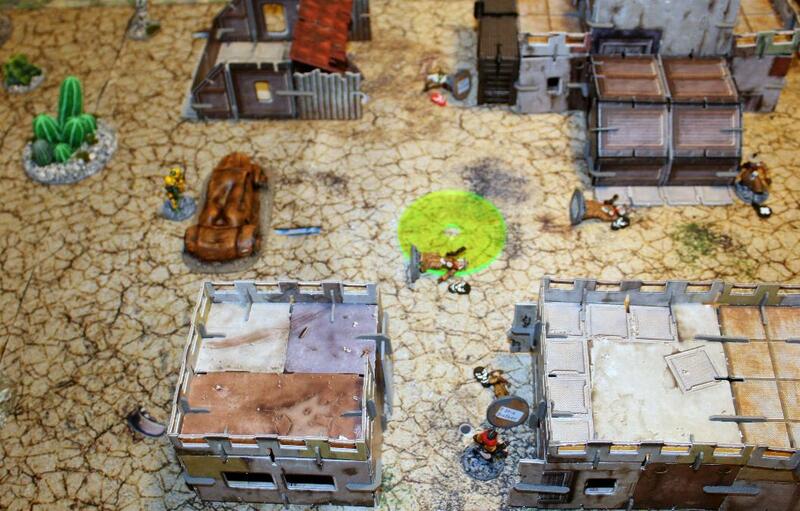 Maybe it was a mistake to use so many Stars in my first game, and thus they really dragged the game on with so many Star chips being returned to the bag, but I can't deny it was a lot of fun and the rules certainly capture the flavour of the Strontium Dog stories perfectly. There is a lot of unpredictability with this game - which chip is going to be drawn next, what cards are going to be used and when? And of course, any game that uses dice is going to be unpredictable. I like the inclusion of the Armoury and the Chicanery cards but I do feel if you're using certain characters, you ought to be able to choose at least some cards that are appropriate for them and the scenario you're playing. The scenarios in The Good, The Bad and The Mutie supplement adopt this rule so I don't think it would break the game if you did too. Knowing what cards to play and when to play them is an important factor. I felt that both sides made excellent use of the Chicanery cards they played. The two Armoury cards played by Team Alpha - No.4 Cartridge and Electronux - swung the game for them. Sadly, the Beam Polarizer that the Stix Brothers played proved to be more of a hindrance than a help! Looking back, I can see a few minor mistakes I made involving the use of various characters' skills; Durham forgot to use her Gunslinger skill when Stix #B shot at her three times; Wulf didn't use his Berserker skill when he took his first injury token; Stix #D forgot to use his Intimidating skill before he fought Durham Red, but these were only minor oversights and wouldn't have changed much if at all. So, my thoughts on the game? I loved it! 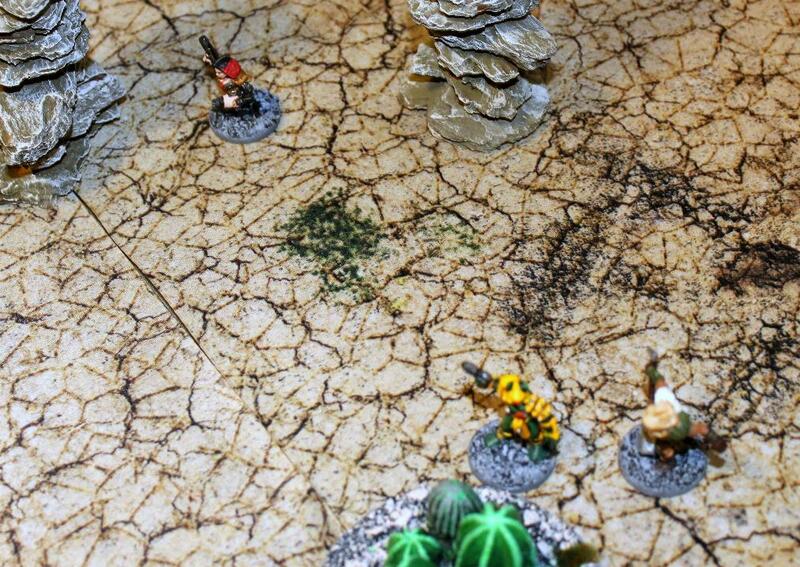 It is great for what it does, which is a small scale skirmish game. The rules are simple and easy to learn. Gameplay is fast. My game only took so long because of all the photographs I took and the copious amount of notes I made. I shall certainly be playing it a lot more in the future. 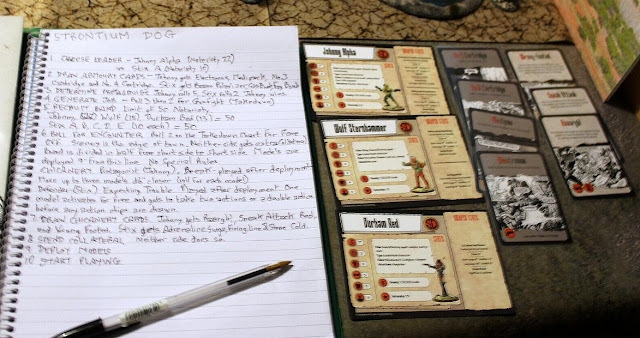 I do plan on playing the four scenarios from The Good, The Bad and The Mutie supplement and posting them here on my blog. 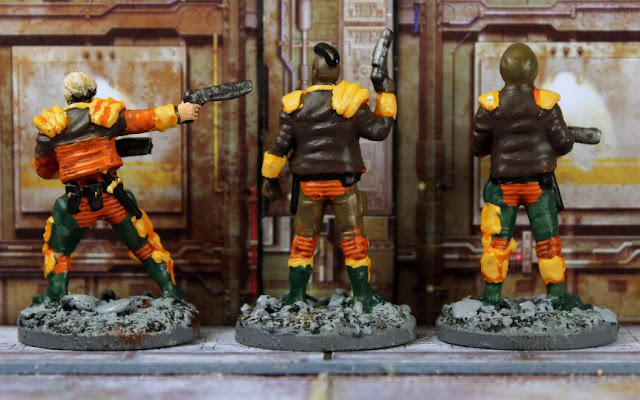 Do I want to run a Strontium Dog campaign? No, I don't... at least not with these rules. I don't mind running one-off games but not a long running campaign. If I run a Strontium Dog campaign I'd want more of a role-playing element to it and that is something I'm hoping will happen if or hopefully, when, EN Publishing produce the Strontium Dog RPG for their WOIN system of games. Their Judge Dredd RPG is imminent (more news on that very shortly). I can't think of anything negative to say about this game. Obviously, as a huge 2000AD fan with Durham Red being my number one favourite 2000AD character, I am going to be slightly biased towards the game. But having played it, I thoroughly enjoyed the experience and I applaud Warlord Games for producing such a wonderful game. I've been promising you a Strontium Dog batrep for a while now and here it is. Because this is my first such batrep it is going to be very rules heavy as I explain everything that is going on. Future batreps will be much shorter and less wordy. Strontium Dog mainly uses special designed six-sided combat dice with Hit symbols (explosions) on three faces, Armour symbols (shields) on two faces and a Special symbol (2000AD logo) on one side. Occasionally, normal d6s are used. Models have six statistics - Move (the distance they can move in inches with one action), Shoot (the number of dice they roll when using a ranged weapon), Fight (the number of dice they roll when in close combat), Evade (the number of dice they roll to dodge an incoming attack), Resist (the number of dice they roll to stop or reduce the damage of an attack) and Cool (which determines how many actions the model can take in a turn or how well the model can avoid getting hit, injured, pinned or stunned). 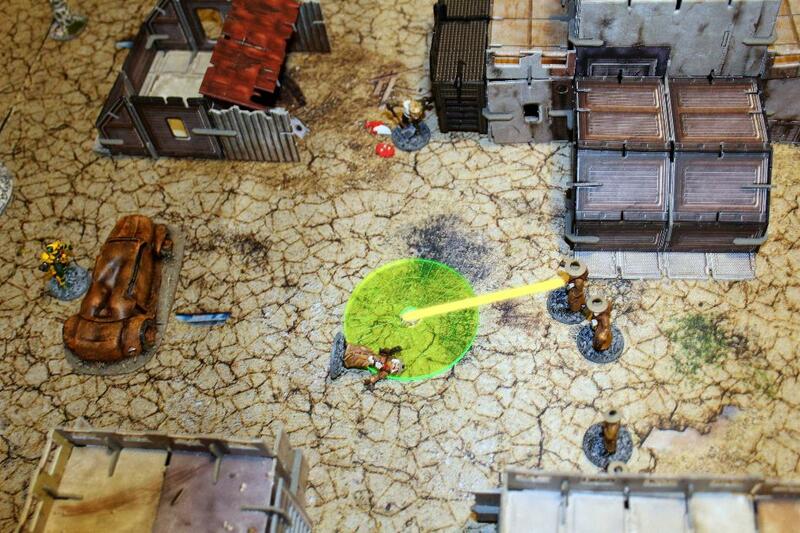 At times a model will have to take a stat test (for example an Evade test to dodge an attack) and if so the player rolls one dice per point of that stat the model has at the time. Unless otherwise stated, a stat test needs a Special result to succeed, in other words, at least one roll that shows the 2000AD logo. Models can take two actions per turn, either two single actions or one double action. Single actions are Move, Snap Shot, Throw, Fight or Shake It Off. 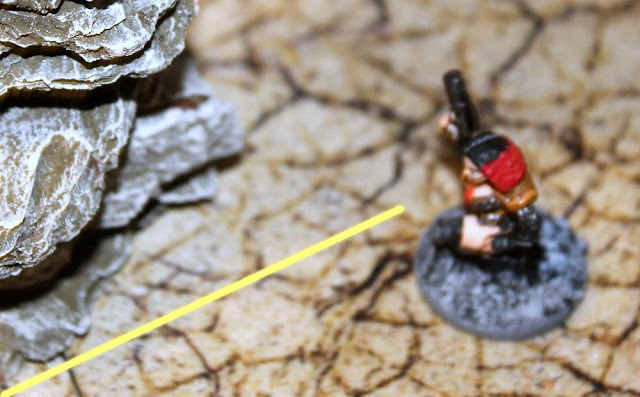 Double actions are Aimed Fire, Sprint, Charge, Jump/Climb, Set Overwatch or Hunker Down. The set up sequence has ten parts and I'll go through each one in turn. I chose Johnny Alpha to lead Team Alpha who'd use the red tokens against Stix Brother #1 to lead the Stix Brothers and they'd use the black tokens. Leaders have to have a Cool stat of 4 or better. Johnny is Cool 5 and Stix is Cool 4. Each side draws six Armoury cards at random and may keep three of them. Johnny has a special skill called Well Equipped, which allows him to retain one extra card. The four cards that Johnny kept were Electronux, Medipack, No.3 Cartridge and No.4 Cartridge. The three cards that Stix #1 kept were Beam Polariser, Frag Bomb and Gas Bomb. To determine which side is the protagonist for the coming side both leaders roll 1d6 and the highest wins. The loser becomes the defender. Ties are re-rolled. I rolled 5 for Johnny and 2 for Stix, so Team Alpha would be the protagonists. To determine what the protagonist wanted to achieve I rolled 1d6 twice on the Job Table on p.80 and got Gunfight followed by Takedown. Both sides would have 100,000 creds Collateral to spend if they wanted. No special rules applied. The game would end when 50% (or more) of a sides named models were down. All models taken down would be worth their bounty value to the other side. I decided to go with the recommended rule of having both sides with a limit of 50 Notoriety. Johnny has a Notoriety of 22. He chose Wulf Sternhammer with a Notoriety of 15 and Durham Red with a Notoriety of 13, bringing him up to 50 exactly. Stix Brother #1 has a Notoriety of 10, so he simply chose four more Stix Brothers to bring his total up to 50. Once the players know what job is being undertaken, it is time to work out how the two sides meet. The defender rolls 1d6 on the Encounter Table on p.81 and cross references it with the protagonist's job to determine the encounter. For the most part, the encounter defines how the models are placed on the table at the start of the game, but also details what extra resources that might be at hand, and particular tricks or strategies one side or the other can employ to gain the upper hand. The encounter I rolled for was Face Off - exchanging threats and insults, the two bands closed on each other determined to be the only ones to walk away. Starting with their leaders, the two sides took turns deploying a model at least 9" away from the centre line running from the short side of the board to the other short side. The defender went first. The board I played on measured 36" by 24", which is smaller than the recommended 36" by 36" but it didn't make any difference to the outcome. Besides which, 3 feet square is just a recommendation and isn't mandatory. 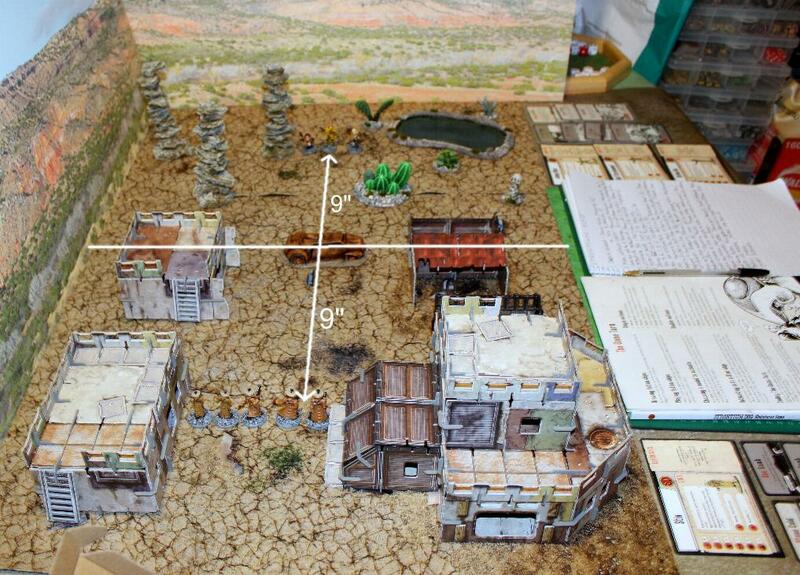 The terrain on the board consists of four of my Battle Systems Shanty Town buildings, one and a half Shanty Town gaming mats, three rock towers that I purchased from Warlord Games but I forget who actually produced them. 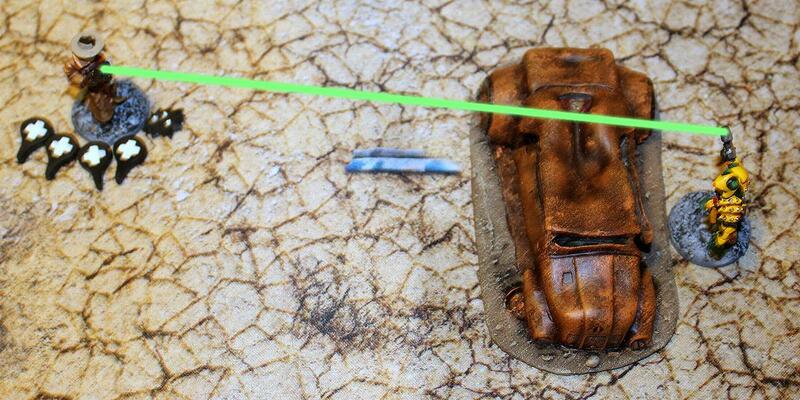 The cacti, small lake and wrecked car are all from Wargames Terrain Workshop. The centre of the car denotes the centre of the gaming board. Here are Durham Red, Johnny Alpha and Wulf Sternhammer lined up next to one of the three rock towers. The Stix Brothers lined up in the main street of the settlement. I identified them as Stix Brothers #1, #2, #3, #4 and #5 from left to right. Neither side gained any extra Collateral for this encounter and no special rules applied. However, each side got a Chicanery tactic to play immediately after deployment and I'll go through them below. For Team Alpha it was Sneak and for the Stix Brothers it was Expecting Trouble. Here's the other side of my dining room table. In the top left is a box containing all the black and red tokens needed for the game. In front of that is my personalised Vampifan Nerd Herd dice bag, a gift from Andy of Da Gobbo's Grotto fame (thanks, Andy!). It'll be used for placing the Action chips in so that I can draw them out without knowing which one I'll be drawing. Next in line is my extendable tape measure; every gamer should have one. The tokens numbered 1 to 5 are there to show which Stix Brother has activated in the turn. To the right of them is the Stix Brother stat card (only one because they're all identical). 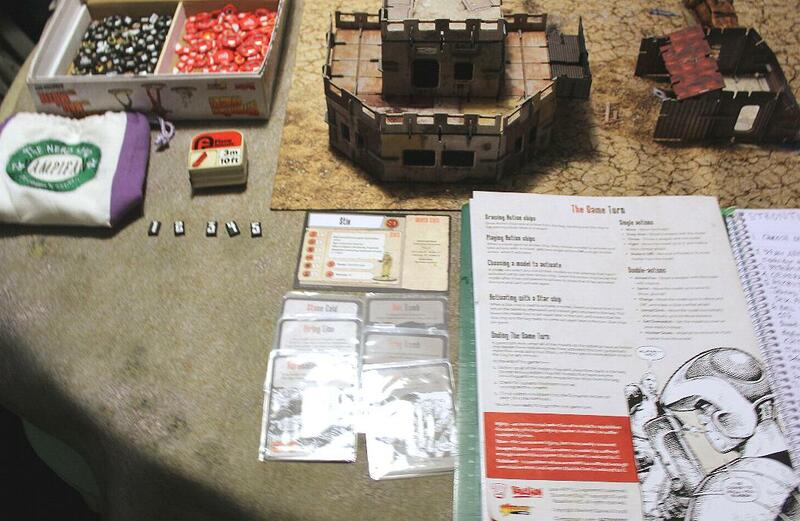 Below it are their 3 Armoury cards and 3 Chicanery cards and finally, at the far right is the rulebook. Now that the players know about the coming fight, they may then spend Collateral to hire more models, giving them additional gear and other expenditures as described in the Collateral rules on p.79. and also in the relevant parts of the encounter description. 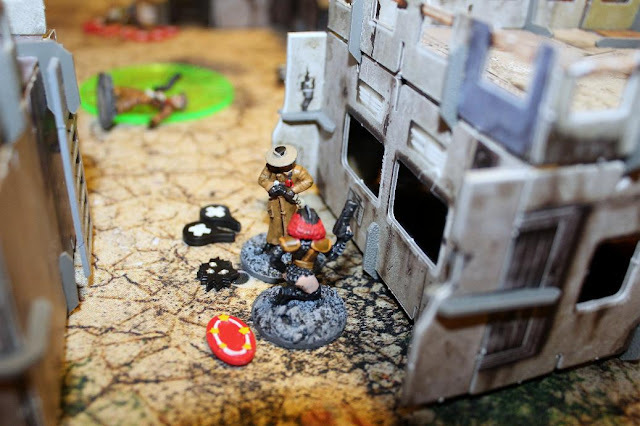 The defending player spends any Collateral first, it being assumed that the protagonist will have done some basic scouting on the enemy before launching an attack. I wanted to keep things simple so neither side spent any Collateral. Scenery and models are placed on the tabletop as described in the encounter description. Before the game could start properly, both sides had a Chicanery tactic to play. For Team Alpha that was Sneak, which allowed them to move up to three models 1d6" closer, rolling for each model separately. Durham moved off to her right 4"; whilst Johnny moved forward and to his left 5", closely followed by Wulf who moved 4". Those were three good rolls. The Chicanery tactic for the Stix Brothers was Expecting Trouble, which allowed them to activate one model for free, who could take two single actions or one double action before any Action chips were drawn. Stix Brother #3 moved his full 5" forward for his first single action. Then he fired a Snap Shot at long range with his Custom Hand Blaster at Durham Red. She was 14" away from him and in the open. Long range for Hand Blasters is between 8" and 16" in this game. No modifiers applied to his Shoot stat of 3 so he rolled 3 combat dice looking for Hits. He scored 1 Hit. Durham got the chance to dodge it by rolling 3 combat dice for her Evade stat of 3, looking for any Special results. She succeeded with 1 Special result and negated the attack. In addition, she had the option of moving 3" in any direction and could change her facing. She moved to cover beside the rock tower. Durham has the Gunfighter skill, which allows her to get a return Snap Shot off at the attacker providing that she not be Pinned (either already or by the incoming attack), have the attacker in her Front Fire arc and have a ranged weapon which can be used for a Snap Shot. She met all three criteria so she Snap Fired back with her twin Custom Hand Blasters. She gained a +1 bonus to her Shoot stat of 3 because she was firing two pistols at once. Looking for Hits on the 4 combat dice she rolled, incredibly she managed to score 4 Hits. This equalled the Stix Brother's Cool stat, so he was automatically Pinned. He attempted to dodge the attack but only having an Evade stat of 1, he failed to get a Special result on the combat die. Next, Durham rolled 4 combat dice for the Power of her pistols to see how much damage she could do. Once again looking for Hits, she scored 3 of them. 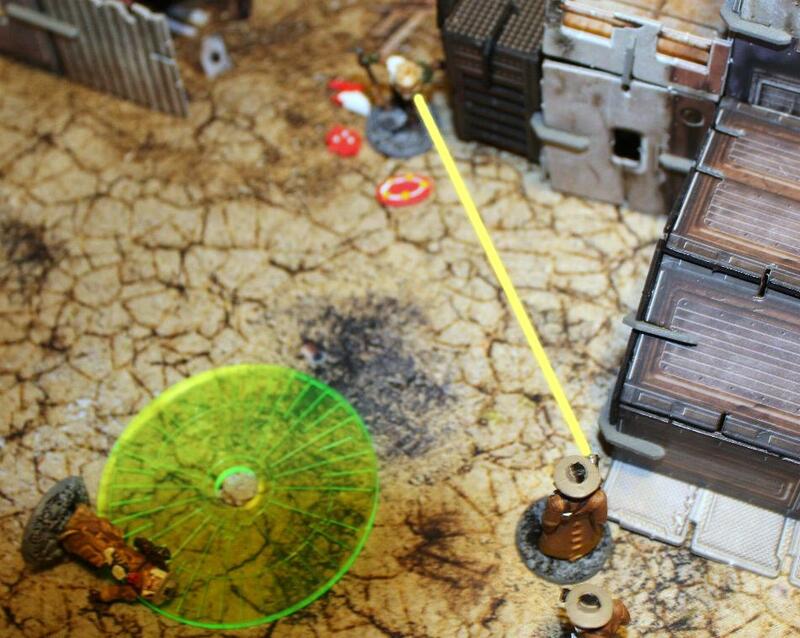 Stix Brother #3 had the chance to reduce their effectiveness by rolling combat dice equal to his Resist stat of 4. He gained a +1 bonus, taking it up to 5 because Durham fired two pistols at once - a case of quantity over quality. Looking for Armour results he only scored 1, so Durham's damage score of 3 was reduced to 2. A result of 2 on the Injury Chart meant that he was seriously injured and he took two Injury markers. For the rest of the game, all of his stats would by reduced by one per Injury marker he sustained. Note that Injury markers can be removed by a Medipack or by taking the Hunker Down double action. Count up the number of Action chips for each side and place them in a bag. The game turn starts by drawing Action chips, one at a time, from a bag. When a player gains an Action chip, they choose a model to activate and take actions with it, either two single actions or one double action. A player can select any one of their models on the table top who hasn't activated yet to use their Action chip. 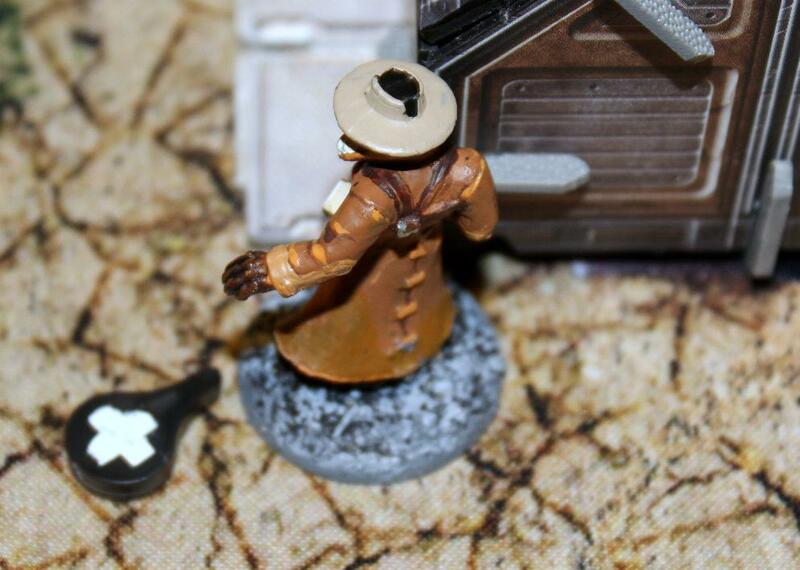 Leave their Action chip beside the model (I placed them on their character cards for Team Alpha or by the five numbered tokens for the Stix Brothers) after it has completed its actions to show it has activated this turn and can't activate again. When a Star chip is drawn (Star chips are used by models with a Cool stat of 4+, which was everyone in this scenario) there is a chance that it isn't left on the table top afterwards and instead gets returned to the bag. This leaves the model free to act again later in the turn and means that a Star chip is in the bag ready to come out again later in the turn. Star chips are good! Once the chosen model has completed its activation from a Star chip, take a Cool test for the model by rolling one combat dice for each point of Cool the model has currently. If any of the dice roll a Special result, the Star chip is returned to the bag and the model may activate again later in the turn with another Action chip (an ordinary one or a Star chip). Theoretically a model could keep being activated indefinitely but even models with Cool 5 will eventually fail. Note that Star chips do not have to be used on models with a Cool of 4 or greater when they are drawn. This represents the leadership and confidence (or fear) by having a hardened bounty hunter or outlaw on the model's team. Clearly the chance of a model with a lower Cool passing the test to return the Star chip to the bag is lower, but it can happen. Failing the Cool test to return a Star chip to the bag comes at a price, however. Not only is the Star chip left in place to indicate that the model cannot activate again this turn, but it also gains a Pinned marker to indicate its overextended and somewhat precarious status. When a model with a Pinned marker activates, roll a number of combat dice equal to the model's Cool stat to remove the Pinned marker. Any Special results rolled removes the Pinned marker with no further effect and is classed as a free action. If the roll is unsuccessful, the activating model must use a single Shake It Off action to remove the marker before doing anything else. I placed three red Star chips for Team Alpha and five black Star chips for the Stix Brothers into my Nerd Herd bag. Turn 1 could now begin. The game only lasted one turn but seeing as it was such a long turn I'll cover it in its entirety in my next post in a few days time. Don't miss it! 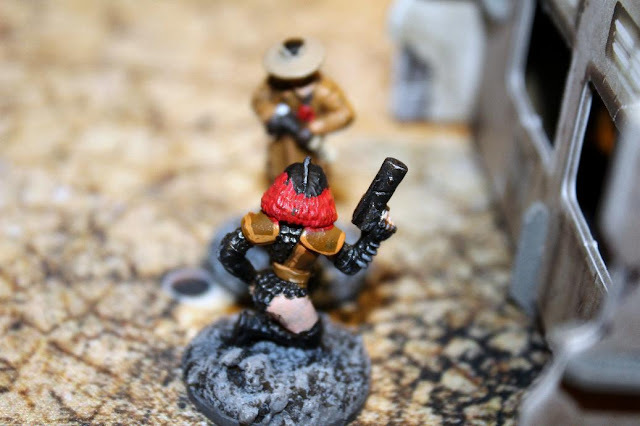 I've shown all of the figures that Warlord Games released for the first wave of their Strontium Dog skirmish game as well as most of my Indyclix and Wargames Foundry figures that are usable in this game. So, is that everything to show? No, it isn't. If you purchase The Good, The Bad and The Mutie boxed set you get a nice scenery set made by Sarissa Precision Ltd. to use in your games. Made of MDF, this set contains seven scenery items - a wind turbine generator, a small farmhouse, a watch tower and four free-standing solar panels. Note that this set is only available in The Good, The Bad and The Mutie boxed set. 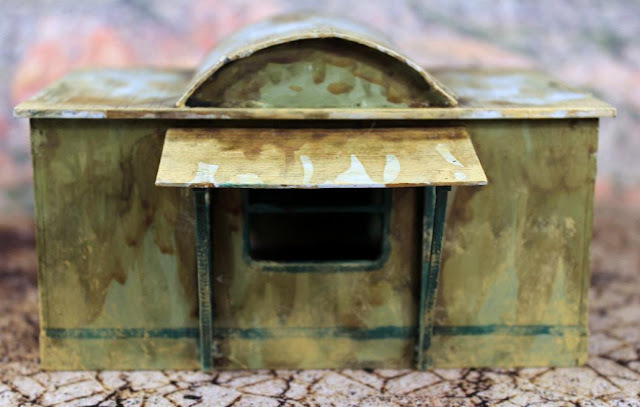 Having made lots of Wild West MDF buildings and scenery items in these past months I found this a very easy collection to make, providing you carefully follow the instructions. There are a few potential pit-traps you can fall in if you don't. For example, the solar panels come in two different angles so it is important that both side supports are identical. Also, note that these scenery items come unpainted. I had a lot of fun making, converting and painting them. What follows is a detailed closer look at the separate items, starting with the farmhouse. This is the front of the house with a set of steps leading up to a pair of double doors. The doors do not open and close. You can punch them out of the wall if you wanted them to be opened, but I left them closed. The awning is made of card, not MDF, which is supplied in the set. It didn't sag in the middle when I first glued it in place but due to constant handling it does have a noticeable sag. It doesn't bother me as I feel it probably would sag in real life. Moving round, this is the view of the right side of the building. Note that the curved section of the roof is also made of card, which has to be scored at regular intervals to get its curved shape. 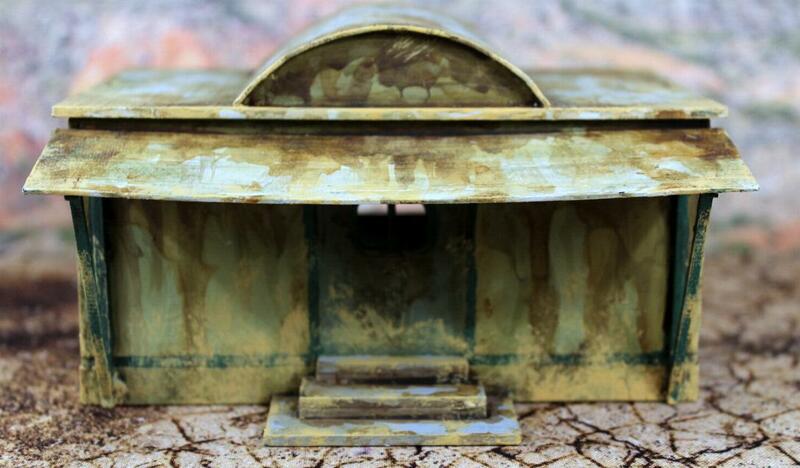 The roof is detachable, unless you decide to glue it in place. Obviously, I didn't. My brother is forever telling me, "you can always tell a Bryan building if the roof comes off." At the back of the building is another window which has a smaller awning covering it. The building is 5" (12.5cm) long by 3.5" (9cm) wide by 2.5" (6.5cm) tall. This is the left side of the building and it is identical to the right side. For its paint scheme, I wanted a very dirty, grungy look for it, so I applied numerous ink washes of different colours to it as well as dry-brushing and stippling a sand colour around the base. 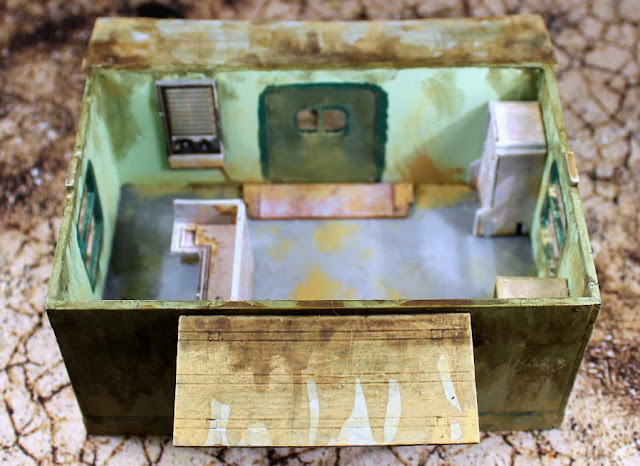 Being a simple model it does not come with any interior detail, but anyone who knows me well will know how much I love furnishing my buildings. 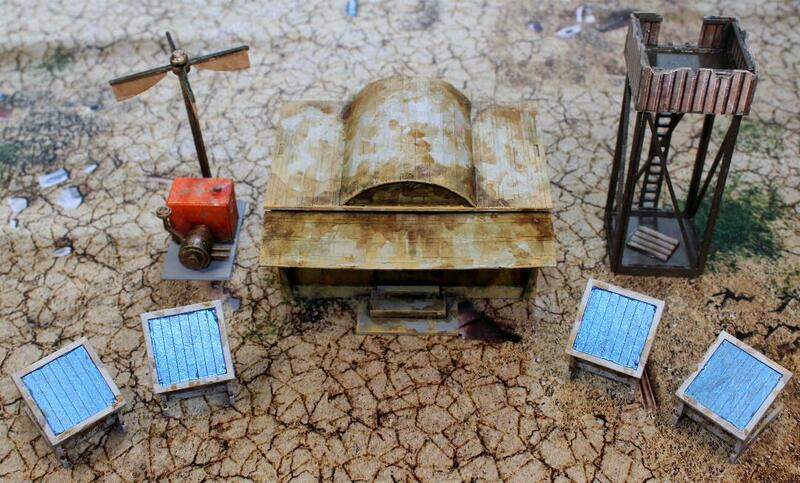 I decided to furnish it with a few items from my Battle Systems Post Apocalypse Terrain sets. This building looks like it would fit perfectly in a post-apocalyptic setting. In the upper left corner is a filing cabinet and on the opposite side is a large desk. 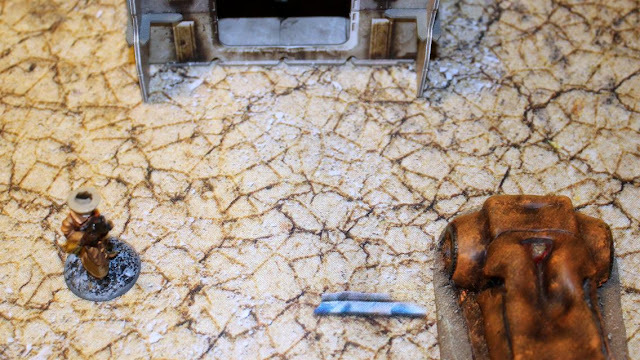 Note how I paint the edges of my card terrain items. 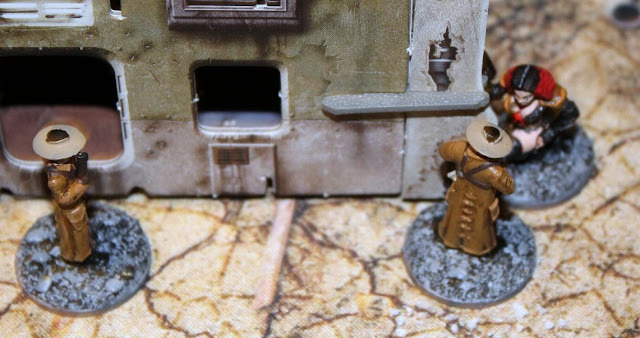 It is time-consuming but it makes the items look "real" and not an obvious cardboard cut-out with glaring white edges - something I hate to see on other peoples' models. Here's a better view of the filing cabinet. In the corner to the left of it is a fridge, although it could just as easily be a storage cupboard. I added a piece of scatter terrain in front of the double doors to make a doormat. On the wall to the left of the doors is the back of the fridge, which I thought could be used as an air-conditioning unit or a wall heater or a power supply unit. The point is, it looks cool and it breaks up the bareness of the wall. In this photo you get a better view of the desk. I thought about adding some chairs but left them out. If I do need them I can always drop them in when required. It is not a lot of furniture that I've added but I didn't want it too cluttered as you need to keep plenty of room to fit figures in, especially as most of mine are on 25mm diameter bases. 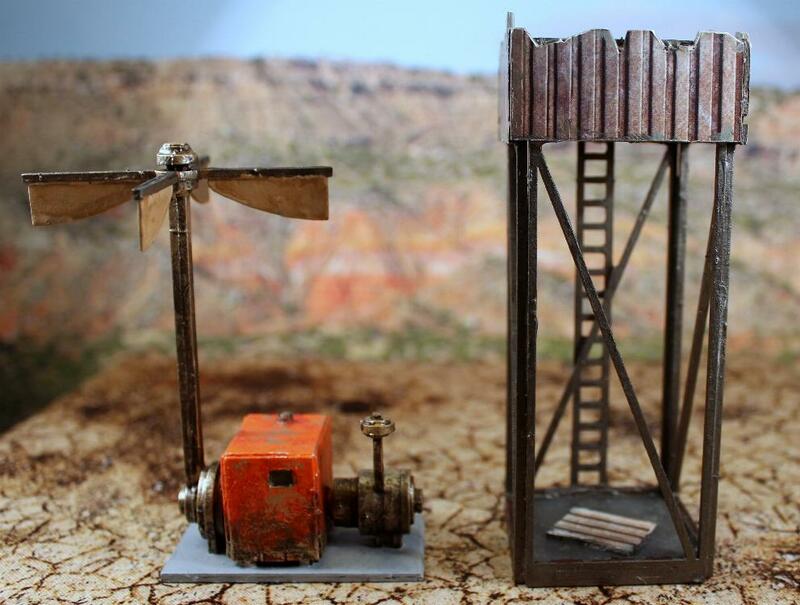 Moving on, here is the wind turbine generator and the watch tower. I've read a few comments from folk saying how difficult the wind turbine generator was to build. It isn't if you carefully follow the instructions, which is what I did. 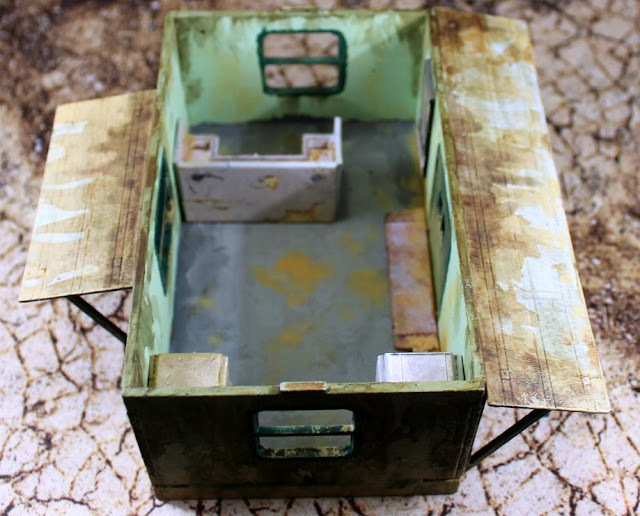 Yes, it is a bit fiddly and it does have a lot of parts, some very small, but just take your time, double check the fits before gluing and above all, follow the instructions! My only criticism of it is that it is fitted to a base made of card not MDF. So, I added a piece of mounting card cut to the same dimensions to my base to make it much more sturdy. 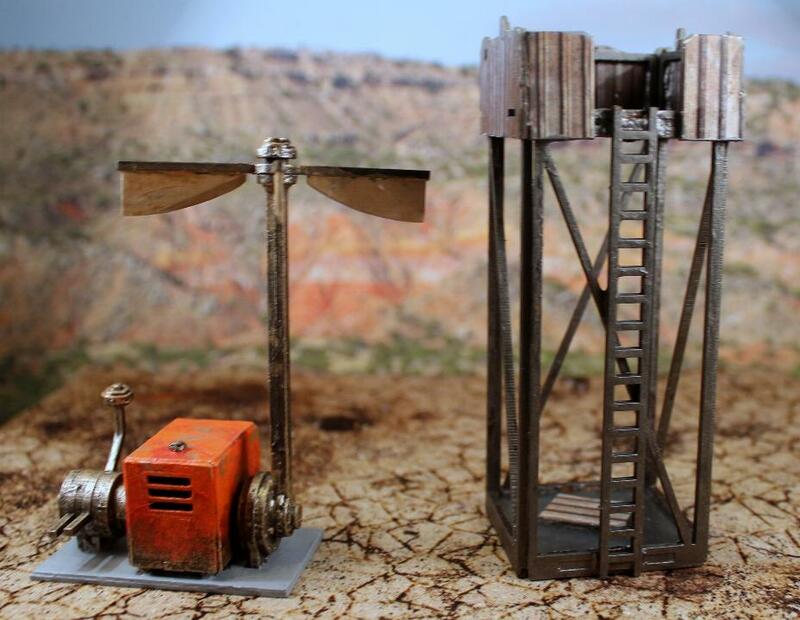 What I do love about this model is that the four blades of the windmill at the top spin round. The watch tower was really easy to build. Just make sure that the two floors match up with their support pegs for the ladder. Note that after I'd glued the four sides in place I ran a line of superglue down the joins where the sides met. This strengthened them considerably. I did not like that the top of the tower was so exposed with no cover whatsoever for anyone standing there. 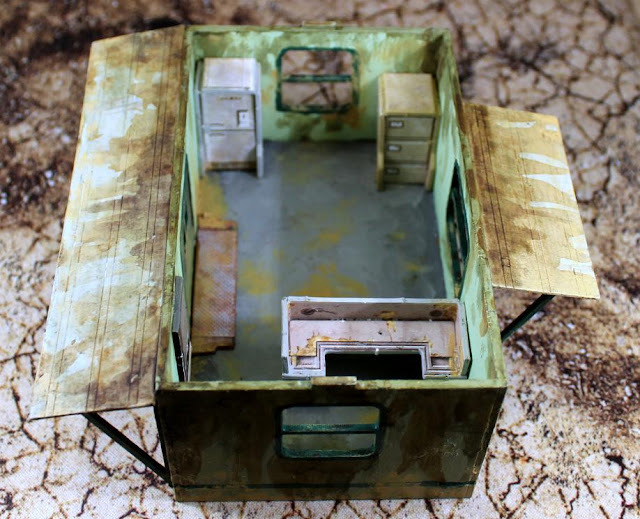 So I took a "corrugated iron" wall from my Battle Systems Post Apocalyptic Terrain set and cut it to size to surround the top section of the tower. The off-cut from the gap left for the ladder was glued to the base. 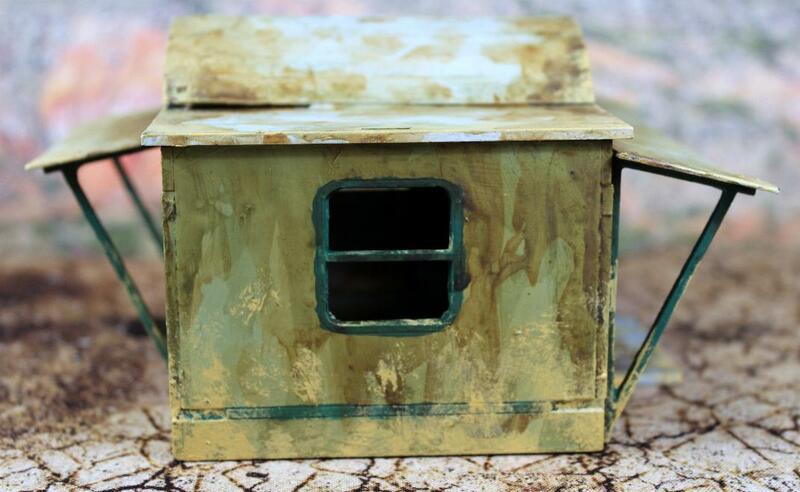 This was a very simple conversion, but one which improved the item considerably. Finally, are the four free-standing solar panels. These were incredibly easy to make, providing you ensure that the two side supports are identical. The panels are fitted in two angles so it would be an easy mistake to mix up the supports and then discover the panels don't align with them. Once again, take your time and check before gluing. This all seems like common sense but I watched a few YouTube videos on someone making this set after I'd made mine and he fell into every pitfall I highlighted. I just shook my head in disbelief! My overall impressions on this scenery set are highly favourable. Visually, they look superb. 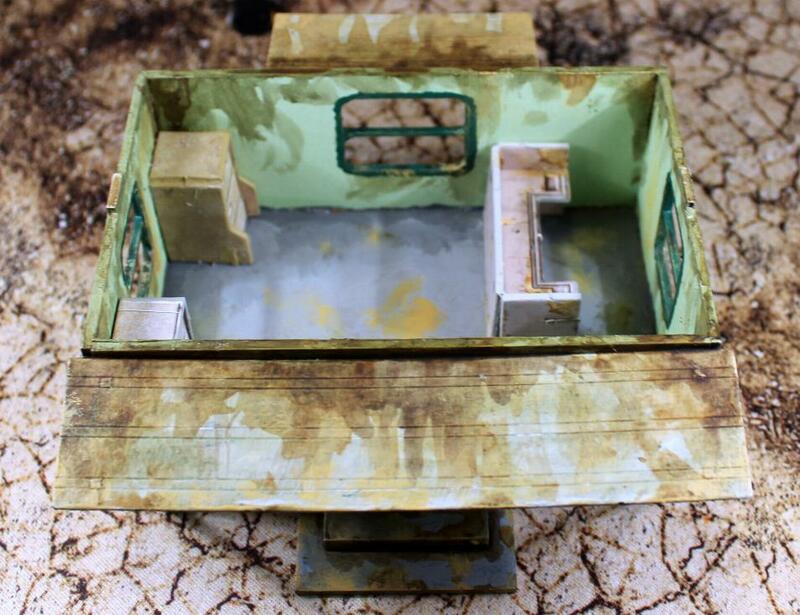 As I said, I had no problems whatsoever in building them but then again, I am very experienced at this type of modelling and I always take my time. What I particularly like about this set is just how versatile it can be. Although designed specifically for the Strontium Dog it can fit in so many settings - post apocalyptic as I've already mentioned, the Cursed Earth of Judge Dredd, any contemporary zombie game or sci-fi game. Just so many choices. It's just a shame it isn't available separately. 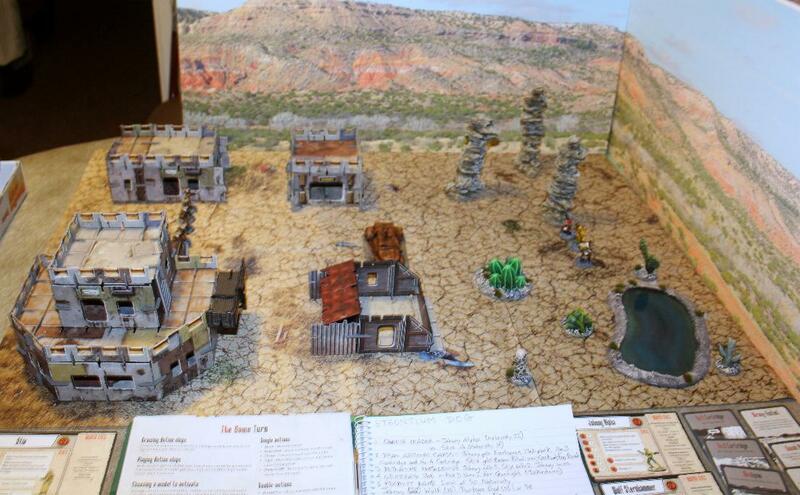 You'll be seeing it in action when I play through the scenarios from The Good, The Bad and The Mutie mini-campaign. For my first Strontium Dog batrep (coming next post 😊 ) I decided not to include it. 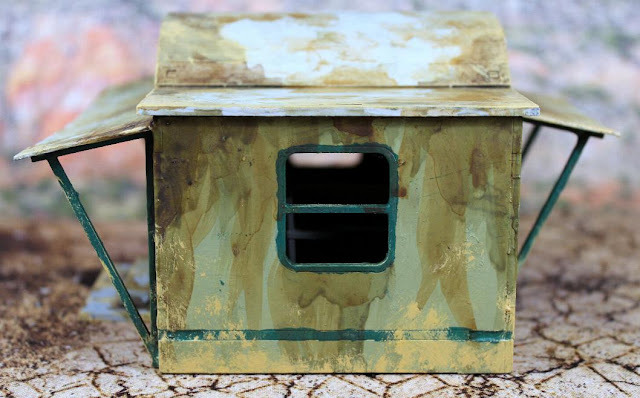 Instead I went for a number of my Battle Systems Shanty Town buildings and scenery items from Wargames Terrain Workshop and Warlord Games. I have played it and I'm in the process of editing it. 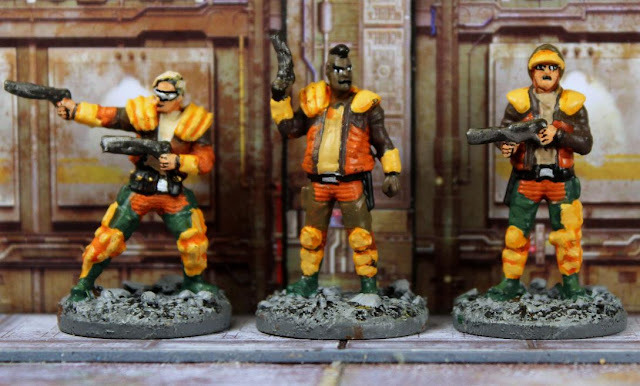 I finish my look at the new wave 1 figures for Warlord Games' Strontium Dog skirmish game as well as a few other figures that can be used in the game. 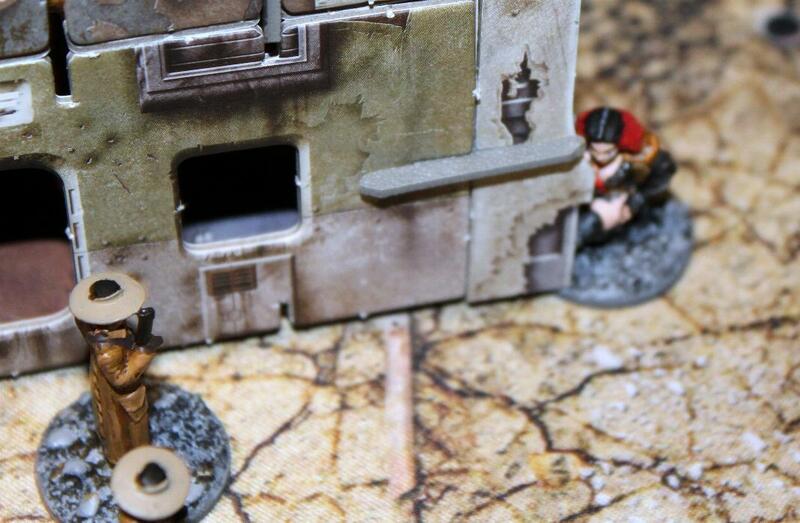 These three figures are sold as Goons by Warlord Games. Goons are classed as Minor Characters, basically unnamed mooks. Leaders can spend Collateral to call upon their allies for extra models during the Set Up at a cost of 50,000 Credits per roll on the tables. 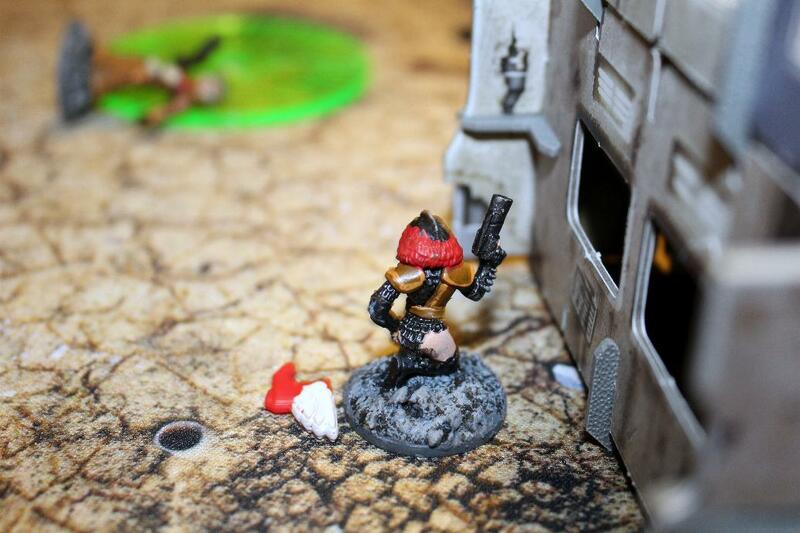 Goons are found on the Outlaws table - the scourge of honest folk, businesses, travellers and their fellow sentient beings wherever they crop up. At the far left is a Goon armed with twin basic hand blasters. His colleague in the centre wields a single basic hand blaster. At the far right, this Goon is armed with a basic blaster rifle. These three figures are sold as a blister pack with no extras for just £8.00. As generic Goons, I do like them. Indeed, I could find a use for them in most sci-fi games, especially Judge Dredd or N.E.W. 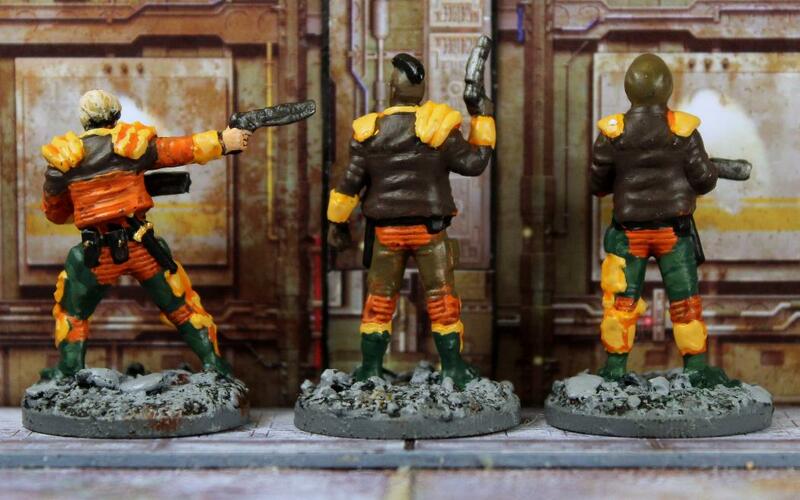 Next up are a pair of Strontium Dogs who were produced by Wargames Foundry - Evans the Fist and the Torso from Tyneside. Both took a major part in the Mutant Uprising against the government in 2167 and were given the ranks of general. They are both allies of Johnny Alpha. Evans the Fist has an abnormally large and strong right arm which gives him a +1 to his Fight stat but -1 to his Shoot stat. Torso's mutation is no head - his facial features are located on his chest and he only has one eye. This gives him a +1 to his Resist stat but he is limited to a Front Facing fire arc due to his limited vision arc. Note that neither of these characters are listed in the Strontium Dog rulebook, but it is an easy matter to work out their stats. I'd class them as Minor Characters. 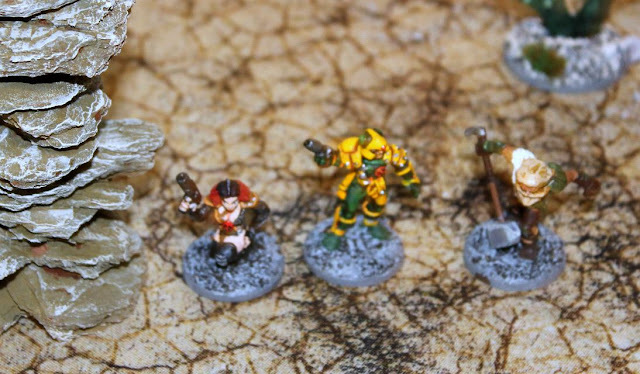 Second from the right is a Kreeler, a soldier and follower of Nelson Bunker Kreelman, the father of Johnny Alpha and a bigoted politician who drafted the anti-mutant laws and gained power on the back of bigotry. As a generic NPC he'd be classed as an Ally from the Military. He is armed with a basic stormer. 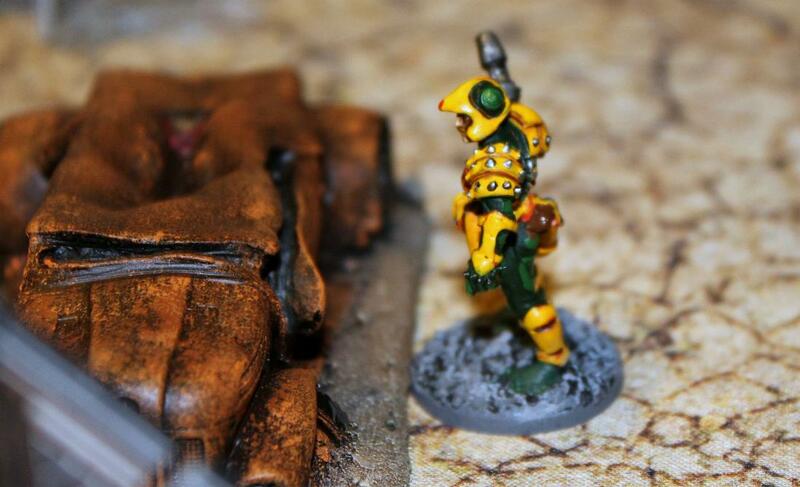 This figure was produced by Wargames Foundry and is now out of production. Finally is a mutant trader called Tombstone Toothbrush. He was a very minor character in the 2000AD comic. I forget which story he appeared in (it wasn't Strontium Dog) but I do remember he was drawn by Kevin O'Neill, so he may have appeared in a Nemesis the Warlock story. His mutations are purely cosmetic in game terms - an oversized head and three fingers per hand. I sculpted him in the 1990's. Note his trademark toothbrush stuck in the side of his hat.